TimeWise® Day Solution SPF 30 helps prevent sun damage such as lines and discolouration before they occur by blocking damageing UVA/UVB rays. TimeWise® Day Solution SPF 30 is part of the proven TimeWise Miracle Set® – a premium collection of age-fighting products formulated with the latest skin care science to deliver maximum results, even for those with sensitive skin and rosacea. * The Miracle Set® offers 11 age-defying benefits: cleanses, exfoliates, freshens, hydrates, smoothes, firms, softens, protects, energises, rebuilds and reduces the appearance of fine lines and wrinkles for a younger-looking you. TimeWise® Day Solution SPF 30 helps prevent sun damage such as lines and discolouration before they occur by blocking damaging UVA/UVB rays. A calming peptide helps relax expression lines. 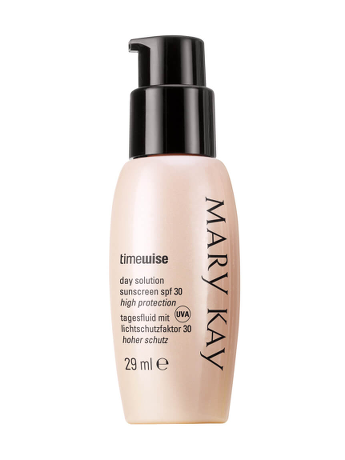 Together, TimeWise® Day Solution SPF 30 and TimeWise® Night Solution deliver the Pronewal System around the clock with crucial protection during the day and boosted renewal at night. *The TimeWise Miracle Set® is not a cure for rosacea and does not treat it, but it is a skin care regimen that’s highly compatible for those who have this supersensitive skin. After cleansing and before your moisture balance step, apply TimeWise Day Solution SPF 30 liberally prior to sun exposure and as often as necessary. Store above 0 degrees Celsius. For external use only. Not to be swallowed. Avoid contact with the eyes. Discontinue use if signs of irritation or rash appear. Sunscreen for UVA/UVB protection helps prevent fine lines and uneven skin tone. Photosomes contain the enzyme photolyase encapsulated in a liposome structure. Photolyase is a bacterial enzyme activated by light that helps to repair photo damage. Algae Extract, a botanical extract, helps minimise the signs of ageing and fortifies the skin against environmental stress; contains substances used to soothe skin and help the protective barrier of the skin. Each TimeWise® product is specifically formulated to combat a wide variety of signs associated with the skin’s ageing. They are designed to work together to maximise the age-fighting benefits.